The grammar and syntax of the New Testament Greek is studied. Passages from the gospels, the Septuagint and Apostolic Fathers are read. Fall and Winter Semester. Attention is given to the practice of textual criticism with the aid of the text-critical apparatus of the Greek New Testament. The history and translation of the Bible into English is briefly surveyed and the requirements for and different methods of translating the Bible are discussed. Fall Semester. A study of the history and the Reformed principles of the interpretation of the Scriptures. Attention is also given to some modern critical methods. Winter Semester. The grammar and idioms of New Testament Greek are studied. The readings concentrate on the Gospel according to Luke and Acts. Prerequisite: 1204 New Testament Greek. Fall Semester. This course deals with the larger Judaic and Greco-Roman context in which the New Testament events took place. Attention is given to the extrabiblical sources for much of that knowledge, to the intertestamental history, to the sects and movements that were current, and to other aspects of daily life in New Testament times. Fall Semester. The grammar and idioms of New Testament Greek are studied. Readings are from the Pauline Epistles. Prerequisite: 1204 New Testament Greek. Fall and Winter Semester. 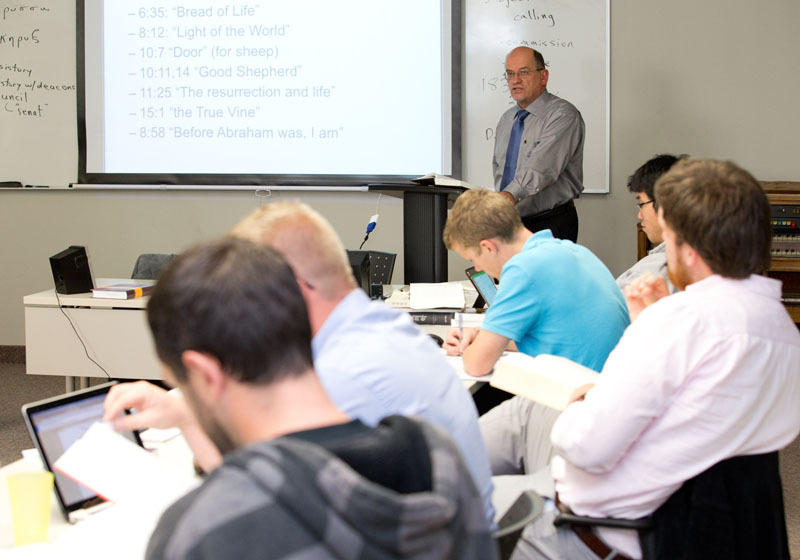 The course deals with the grounds for and the history of the recognition of the books in the New Testament as holy and canonical. Further, these books are studied with respect to their place and purpose in the canon, and the contents of most of the books are surveyed. Fall Semester. Selected chapters of the Pauline, Johannine or Petrine letters are studied with a view to their original context and their contemporary significance. Winter Semester. The grammar and idioms of New Testament Greek are studied. The readings are from the book of Hebrews, the Catholic Epistles and Revelation. Prerequisite: 1204 New Testament Greek. Fall and Winter Semester. The concept of a "history of revelation" is discussed and attention is paid to how Christian thought develops from the teachings of the Lord Jesus in the Gospels to the writings of the apostle Paul. Winter Semester. This course will take a closer look at some of the hermeneutical and methodological issues dealt with in NT 1206. Attention will also be paid to the narrative-critical approach to interpreting the New Testament. Fall Semester.